Since a film typically comprises several hundred (if not thousands) of shots describing its style clearly and concisely can be challenging. This is further complicated by the fact that editing patterns change over the course of a film. Numerical summaries are useful but limited in the amount of information they can convey about the style of a film, and while two films may have the same median shot length or interquartile range they may have very different editing patterns. Numerical summaries are useful for describing the whole of a data set but are less effective when it comes to accounting for changes in style over time. These problems may be overcome by using graphical as well as numerical summaries to communicate large amounts of information quickly and simply. Graphs also fulfil an analytical role, providing insights into a data set and revealing its structure. A good graph not only allows the reader to see what is important about a data set the writer wishes to convey, but also enables the researcher to discover what is important in the first place. It should be common practice in the statistical analysis of film style to include graphical summaries of film style (though this is rarely the case), and there are several different types of simple graphs that can be used. These include cumulative distribution functions, box-plots, vioplots, and time-ordered displays such as run charts and order structure matrices. In this post I describe two different uses of kernel density estimation as graphical methods for analysing film style. The next section introduces the basics of kernel density estimation. Section three discusses the use of kernel densities to describe and compare shot length distributions, while section four applies kernel densities to the point process of two RKO musicals to describe and compare how cutting rates change over time. The kernel density is a nonparametric estimate of the probability density function of a data set, and shows us the range of the data, the presence of any outliers, the symmetry of the distribution (or lack thereof), the shape of the peak, and the modality of the data (Silverman 1986; Sheather 2004). A kernel density thus performs the same functions as histogram but is able to overcome some of the limitations of the latter. Since no assumptions are required about the functional form of the data kernel densities are a useful graphical method for exploratory data analysis (Behrens & Yu 2003). The purpose of exploratory data analysis is to reveal interesting and potentially inexplicable patterns in data so that we can answer the general question ‘what is going on here?’ Kernel densities allows us to this by describing the relative likelihood a shot in a film will take on a particular value, or by allowing us to see how the density of shots in a film changes over time. where n is the sample size, h is a smoothing parameter called the bandwidth, and K is the kernel function. There are several choices for K (Gaussian, Epanechnikov, triangular, etc.) though the choice of kernel is relatively unimportant, and it is the choice of the bandwidth that determines the shape of the density since this value controls the width of the kernel. If the bandwidth is too narrow the estimate will contain lots of spikes and the noise of the data will obscure its structure. Conversely, if the bandwidth is too wide the estimate will be over-smoothed and this will again obscure the structure of the data. The kernel density estimate is an improvement on the use of histograms to represent the density of a data set since the estimate is smooth and does not depend on the end-points of the bins, although a shared limitation is the dependence on the choice of the bandwidth. Another advantage of the kernel density is that two or more densities can be overlaid on the same chart for ease of comparison whereas this is not possible with a histogram. Figure 1 illustrates this process for Deduce, You Say (Chuck Jones, 1956), in which the density shows how the shot lengths of this film are distributed. Beneath the density we see a 1-D scatter plot in which each line indicates the length of a shot in this film (xi), with several shots having identical values. The Gaussian kernels fitted over each data point are shown in red and the density at any point on the x-axis is equal to the sum of the kernel functions at that point. The closer the data points are to one another the more the individual kernels overlap and the greater the sum of the kernels – and therefore the greater the density – at that point. All widely available statistical software packages produce kernel density estimates for a data set. An online module for calculating kernel densities can be found here. A shot length distribution is a description of the data set created for a film by recording the length of each shot in seconds. Analysing the distribution of shot lengths in a motion picture allows us to answer questions such as ‘is this film edited quickly or slowly?’ and ‘does this film use a narrow or a broad range of different shot lengths?’ Comparing the shot length distributions of two or more films allows us to determine if they have similar styles: is film A edited more quickly than film B and does it exhibits more or less variation in its use of shot lengths? A kernel density estimate provides a simple method for answering these questions. 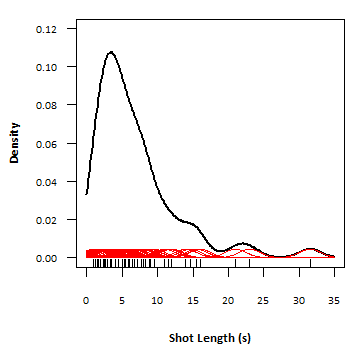 From the kernel density of Deduce, You Say in Figure 1 we see the distribution of shot lengths is asymmetrical with the majority of shots less than 10 seconds long. There is a small cluster of shots around 15 seconds in length, and there are three outliers greater than 20 seconds. From just a cursory glance at Figure 1 we can thus obtain a lot of information very quickly that can then guide our subsequent analysis. for example, we might ask what events are associated with the longer takes in this film? Suppose we wanted to compare the shot length distributions of two films. Figure 2 shows the kernel density estimates of the Laurel and Hardy shorts Early to Bed (1928) and Perfect Day (1929). It is immediately that clear though both distributions are positively skewed, the shot length distributions of these two films are very different. The density of shot lengths for Early to Bed covers a narrow range of shot lengths while that for Perfect Day is spread out over a wide range of shot lengths. 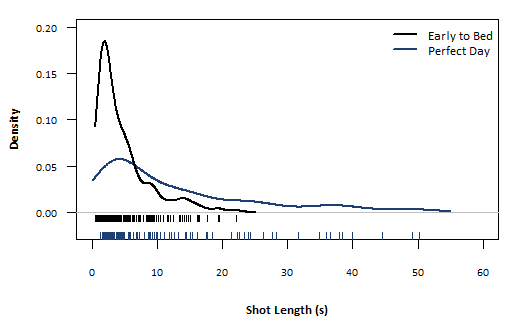 The high density at ~2 seconds for Early to Bed shows that the majority of shots in this film are concentrated at lower end of the distribution with few shots longer than 10 seconds, while the lower peak for Perfect Day shows there is no similar concentration of shots of shorter duration and the shot lengths are spread out across a wide range (from 20 to 50.2 seconds) in the upper tail of the distribution. We can conclude that Early to Bed is edited more quickly than Perfect Day and that it shot lengths exhibit less variation; and though we could have come to these same conclusions using numerical summaries alone the comparison is clearer and more intuitive when represented visually. Figure 3 shows the one-to-one nature of this relationship clearly. Analysis of the cutting rate requires us to think of the editing of a film as a simple point process (Jacobsen 2006). A point process is a stochastic process whose realizations comprise a set of point events in time, which for a motion picture is simply the set of times at which the cuts occur. We apply the same method used above to the point process to produce a density estimate of the time series. Just as the density in the above examples is greatest when shot lengths are closer together, the density is greatest when one shot quickly follows another and, therefore, the shorter the shot lengths are at that point in the film. Conversely, low densities indicate shots of longer duration as consecutive shots will be distant from one another on the x-axis. This is similar to the use of peri-stimulus time histograms and kernel methods in neurophysiology to visualize the firing rate and timing of neuronal spike discharges (see Shimazaki & Shinamoto 2010). Using kernel density estimation to understand the cutting rate of a film as a point process is advantageous since it requires no assumptions about the nature of the process. Salt (1974) suggested using Poisson distributions as a model of editing as a point process described by the rate parameter λ, but this method is unrealistic since homogenous Poisson point processes are useful only for applications involving temporal uniformity (Streit 2010: 1). For a motion picture the probability distribution of a cut occurring at any point in time is not independent of previous cuts, and the time series will often be non-stationary over the course of a film while also demonstrating acceleration and deceleration of the cutting rate because different types of sequences characterised by different editing regimes. We expect to see clusters of long and short takes in a motion picture and so the assumption of a Poisson process will not be appropriate, while the presence of any trends will mean that the process does not satisfy stationarity. Modelling the cutting rate as an inhomogeneous Poisson point process by allowing λ to vary as function of time may solve some – though not necessarily all – of these problems. To illustrate the use of kernel densities in time series analysis we compare the editing of two films tow feature Fred Astaire and Ginger Rogers: Top Hat (1935) and Shall We Dance (1937). In order to make a direct comparison between the evolution of the cutting rates the running time of each film was normalised to a unit length by dividing each shot length by the total running time. In this case we treat slow transitions (e.g. fades, dissolves, etc) as cuts, with the cut between two shots marked at the approximate midpoint of the transition. Figure 4 shows the resulting densities. From the plot in Figure 4 for Top Hat we see the density for this film comprises a series of peaks and troughs, but that there is no overall trend . The low densities in this graph are associated with the musical numbers, while the high densities occur with scenes based around the rapid dialogue between Astaire and Rogers. (See here for alternative time series analyses of Top Hat that use different methods but arrive at the same conclusions as those below). The first musical number is ‘No Strings (I’m Fancy Free)’, which begins at ~0.07. Astaire is then interrupted when Rogers storms upstairs to complain about the racket, and we have a scene between the two in which both the dialogue and the editing are rapid. This occurs at the peak at ~0.11 to ~0.13, and is then followed by a reprise of ‘No Strings,’ which is again shot as a long takes. The next section of the film follows on the next day as Astaire takes on the role of a London cabby and drives Rogers across town and as before this dialogue scene is quickly edited resulting in a high density of shots at ~0.19. This sequence finishes with ‘Isn’t This a Lovely Day (to be Caught in the Rain),’ which accounts for the low density of shots at ~0.21 to ~0.27 since this number again comprises long takes. The rapid cutting rate during dialogue scenes is repeated when Rogers mistakes Astaire for a married man at the hotel, and is again followed by the low density of a slow cutting rate for the scenes between Astaire and Edward Everett Horton at the theatre and the number ‘Top Hat, White Tie and Tails’ at ~0.4. After this number the action moves to Italy and there is much less variation in the density of shots in the first part of these scenes, which are focussed on dialogue and narrative. There is no big musical number until ‘Cheek to Cheek’ and this sequence accounts for the low density seen at ~0.66, being made up of just 13 shots that run to 435.7 seconds. The density increases again as we move back to narrative and dialogue until we get to the sequence between in which Horton explains the mix-up over who is married and who is not to the policeman and ‘The Piccolino’ which begins at ~0.89 and runs until ~0.96. 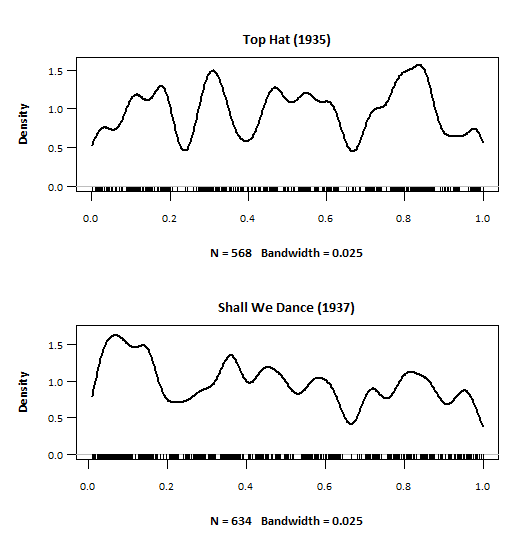 The density plot of the point process for Shall We Dance differs from that of Top Hat showing a trend over the running time of the film from higher to lower densities of shots, indicating the cutting rate in this film slows over the course of the film. Nonetheless we see the same pattern of troughs and peaks, and as in Top Hat these are associated with musicals and comedy scenes, respectively. This film features numerous short dancing excerpts in its early scenes, but there is no large scale musical number until well into the picture. In fact, these early scenes are mostly about stopping Astaire dancing (e.g. when Horton keeps turning off the record), and the dialogue scenes that establish the confusion over Astaire’s married status as the ship departs France. These scenes are based around a similar narrative device to that used in Top Hat and are again edited quickly. The first big number in the film is ‘Slap that Bass’ and coincides with the low density section of the film beginning at ~0.17, indicating that this part of the film is edited more slowly that the first section. The cutting rate slowly increases until ~0.37, and this section includes the ‘Walking the Dog’ and ‘I’ve Got Beginner’s Luck’ numbers but is mostly made up of dialogue scenes between Astaire and Rogers. After this point the film exhibits a trend from higher to lower densities and there are a number of smaller cycles present between 0.37 and 0.64. This section includes the numbers and ‘They All Laughed (at Christopher Columbus)’ and the subsequent dance routine, which begins at ~0.48 and includes the trough at ~0.54. The low density section beginning at 0.64 is the scene between Astaire and Rogers in which they try to avoid reporters in the park, and comprises a number of lengthy dialogue shots and the film’s most famous number, ‘Let’s Call the Whole Thing Off.’ The editing then picks up during the dialogue scenes until we reach the next drop in the density at ~0.74 which coincides with the scenes on the ferry to Manhattan as Astaire sings ‘They Can’t Take That Away From Me.’ The next low density section begins at ~0.9, and is the big production at the end of the film with the distant framing and static camera completing the long takes in showing off the ‘Hoctor’s Ballet’ sequence, which then gives way to a more rapidly cut section featuring numerous cut-ways from the dancers to Rogers’ arriving at the theatre with the court order for Astaire only to discover him on stage with dancers wearing masks of her face. The cutting rate then slows once more as Rogers insinuates herself into the ‘Shall We Dance’ routine and the film reaches its finale. Comparing the two plots we note some of the low density periods coincide with one another. This is most clearly the case at around 0.2 and 0.64 in both films. The major numbers that end the films also occur at similar points in the narratives. This indicates that a musical number occurs at approximately the same points in both films even though the two films have different running times (Top Hat: 5819.9s, Shall We Dance: 6371.4s). This raises some interesting questions regarding the structure of other musicals featuring Astaire and Rogers. Is there always a musical number about a fifth of the way into an RKO musical featuring this pair? Is there always a major number about two-thirds the way through picture? And does the finale always occupy the last 10 per cent of the picture? Answers to these questions will have to wait until I finish transcribing all the films Astaire and Rogers made for RKO in the 1930s. Kernel density estimation is a simple method for analysing the style of motion pictures, and the wide availability of statistical packages makes the use of kernel densities easy to incorporate into empirical research. Since it requires no prior assumptions about the distribution of the data this method is appropriate for exploratory data analysis. In this paper we demonstrated the how this method may be used to describe and compare the shot length distributions of motion pictures and for the time series analysis of film style. Behrens JT and Yu C-H 2003 Exploratory data analysis, in JA Schinka and WF Velicer (eds.) Handbook of Psychology: Volume 2 – Research methods in Psychology. Hoboken, NJ: John Wiley & Sons: 33-64. Jacobsen M 2006 Point Process Theory and Applications: Marked Point and Piecewise Deterministic Processes. New York: Birkhauser. Salt B 1974 Statistical style analysis of motion pictures, Film Quarterly 28 (1): 13-22. Sheather SJ 2004 Density estimation, Statistical Science 19 (4): 588-597. Shimazaki H and Shinamoto S 2010 Kernel bandwidth optimization in spike train estimation, Journal of Computational Neuroscience 29 (1-2): 171-182. Silverman B 1986 Density Estimation for Statistics and Data Analysis. London: Chapman & Hall. Streit RL 2010 Poisson Point Processes: Imaging, Tracking, and Sensing. Dordrecht: Springer.